Before my recent trip to Hungary I did the requisite research: I looked up the important holiday words (Please, Thankyou, Hospital, Bail, Embassy) and, most importantly, what the local speciality spirits were. Two popped up – Palinka and Unicum. 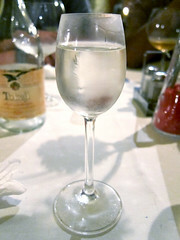 Palinka has various descriptions ranging, depending on the opinions of the person doing the describing, from fruit brandy to schnapps to death in liquid form. It’s a clear spirit distilled from fruit and still retaining some of the fruity flavour of its ingredients. Palinka as a term has been pretty widely applied to a variety of fruit based booze over the years, but since 2002 it has been enshrined in EU law as coming from Hungary (and a few places in Austria in the case of apricot palinka) and restrictions have been placed on the definition. Only certain fruits can be used (Plum, apricot, pear, cherry, quince, grape and maybe chestnut) and there are also designations for various aging techniques (lengths of time, wood or steel containers, with fruit in or not). Unfortunately I didn’t get to taste much in the way of variety – one with some fruit in and the rest just clear, young (as far as I could tell) fiery palinka. 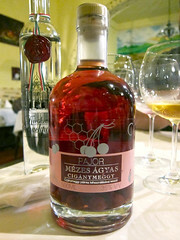 Pajor Mézes Ágyas Cigánymeggy (Cherry) Palinka – Mézes means honeyed and ágyas (literally ‘bedside’, according to Wikipedia) indicates that the palinka has been matured with fruit in for at least 3 months. This was the first that I tried and the least favourite on the table. Coloured red from the steeped fruit and tasting strongly of fresh cherry it was very sweet and cloying from the honey. Kecskeméti Barackpalinka – Apricot palinka from the Kecskemét region, one of the combinations of fruit and area that has been made a Protected Designation of Origin (PDO). I couldn’t make out the producer on the label and my internet searches weren’t helped by the fact that almost all kecskeméti apricot palinkas use a similarly shaped tall thin bottle. This one had a fantastic fresh apricot nose, with both sweet and sourness coming through. However, it tasted like rocket fuel, with the neat alcohol aquavit-like dryness swamping any fruity flavours that survived the distillation process. 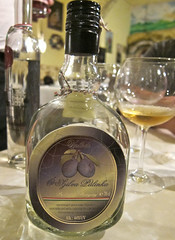 Valódi Szilva (Plum) Palinka – This was the type of palinka that I was told was most common and popular, and I can both see why and not at the same time. On the nose it had very little plum, retaining a general sour fruit note and little else rather than alchohol. To taste it had a strong sour schnapps flavour which I rather liked, but which noone else at the table did. This was unfortunate as our waiter gave us a complimentary round of them at the end of the meal and being the most polite person at the table I felt compelled to drink them so as not to offend our hosts. Or so I claim. The evening is hazy from then on. Gündel Birsalma (Quince) Palinka – The only other time I got to try some palinka, after a meal at Bagolyvar (the more downmarket sister restaurant to Gündel, one of Budapest’s oldest and most expensive restaurants). This was the best of the lot, with loads of quince on the nose and a nice combination of booze and fruit to taste. In general Palinka was not my thing – smells like fruit, tastes like death. I pinned my hopes on the second spirit on the list – Unicum. Unicum is a brand name for a type of herby, bitter digestif produced by the Zwack family since 1790 and seemingly everywhere in Budapest. Along with the regular Unicum they also produce Unicum Next, a lighter sweeter version that I grabbed a bottle of to bring home. 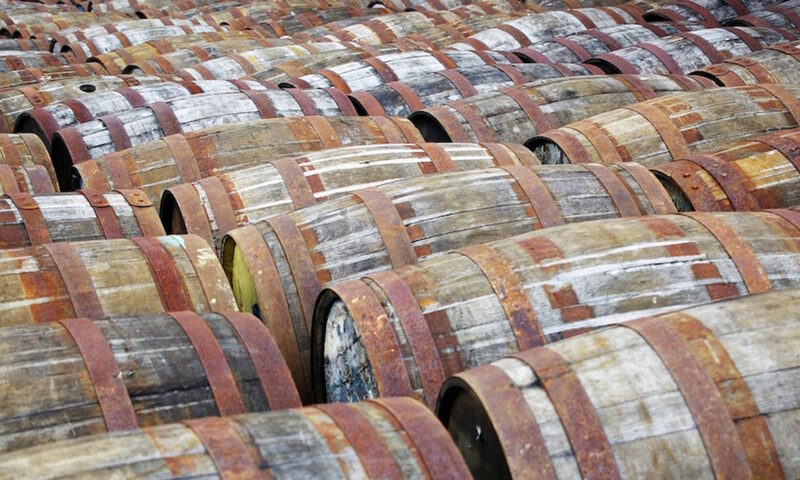 Zwack don’t only stick with Unicum, being also a producer of Palinka and other spirits, running tours around both the Unicum factory and their distillery in Kecskemét. Regular Unicum is a thickish black liquid that looks rather worrying. It has quite a punch on the nose, with strong bitter herbs, liquorice and wood. To taste it’s, to me, almost unpalatable – very bitter indeed with a heavily tannic aftertaste behind the initial pleasant herbs that removes any enjoyment I might have had from it. It reminds me a bit of the bitters that I used to buy little bottles of at the supermarket checkouts when I lived in Vienna – easy for me to smuggle back to the UK as illicit booze for my 16 year old self to try and get drunk on. Filthy stuff with a flavour that stopped me from ever drinking enough to get tipsy. 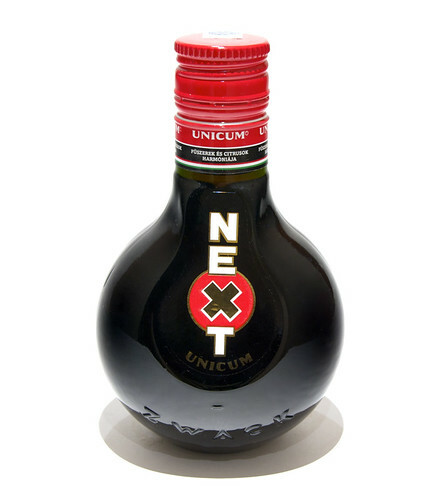 The Unicum next is quite different – browny red in colour and much more liquid. On the nose it has the distinctive bitter herbs as well as a sugary sweetness and hint of citrus – a bit like candied orange and lemon cake decorations. To taste it removes the bitter punch of regular Unicum, keeps the spice and herbs, and adds a syrupy sweetness to the finish. The citrus peel, that I assume is in the bitter mix, comes out and adds a hint of bitterness to the aftertaste. It’s got an almost ‘Christmassy’ taste to it and a slug of it in a glass of red and you’d have instant mulled wine. A block of ice waters things down a bit too much, but a frozen bottle would be perfect – thickening up the spirit and adding a refreshing cold kick to the rather pleasant flavour. My summer holidays this year were in three parts, and sandwiched between trips to the Great British Beer Festival and Edinburgh was a stag weekend in Budapest. Rather than the usual stag traditions of throwing the cheapest beer possible down our necks before stapling the groom-to-be to the nearest national monument we went more for the ‘drink interesting things before thinking about stapling the groom-to-be to the nearest national monument but then give up on that as too much effort’ approach. Part of my drinking mission was to try and find as many different beers as I could, which wasn’t as easy as I’d hoped due to there basically being only three different Hungarian beers on offer. Luckily the import market, mainly due to the breweries all being owned by international companies, is alive and well giving me a bunch more for my list. Dreher Classic – The most common beer we found, mainly on Draught and occasionally in bottles. It was a good fall back beer if there wasn’t anything more interesting – a crisp lager with some actual flavour, a malty middle and sweet aftertaste that got more cloying the worse kept the pipes were. 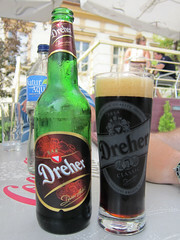 Dreher Bak – One I only managed to get to on the last day – the Dreher dark beer, bottled. Burned toffee on the nose with a prickle of booze. Dry tasting finish (which my notes have ‘flinty?’ written beside) and a nice fruity malt body. Probably my favourite of the Hungarian beers and one that didn’t have the hollow middle that I’ve often found in dark continental beers. Soproni – Brewed by Heineken, this was one that we first tried at pretty much the only bar we found open at 3am. Everyone else commented on how easily it slipped down, but it stuck in my throat a bit. It was musty with an unpleasant sweetness, which I initially put down to the dodgy bar that I first tried it in. However, I tried it again at another bar to be greeted with the same nasty taste. Borsodi draught – Quite similar to Dreher but with a bit more of a grainy taste to it. ‘Crisp start, flabby behind’ my slightly wobbly notes read. Borsodi bottled – I tried this one while sitting on a boat on the Danube, wearing sunglasses and talking crap. This may have had an effect on my appreciation of the beer, which I not only liked but wrote a lot about. From the notes: ‘A nice hoppy beer backed up with a rather flat body. Sweet start fading quickly to nothing. Improves in the glass with more flavour appearing – malt and a nice bitter hope turning soapy on the finish’. It was cold and the day was hot – what was needed. 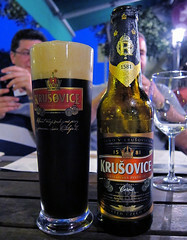 Krusoviče Cerné – A dark imported Czech beer from an old brewery that is now part of the Radeberger group. I grabbed a bottle of this to accompany a plate of pork stew. A dry dark lager, quite light in the middle but with a burned treacle toffee finish. Radeberger – The beer I chased the Krusovice with. A dry and grainy lager with a lingering sweetness. Sailor Pils – We stopped one evening in the Sailor Inn, a riverside belgian beer bar with an awning that sprayed a fine watery mist over the drinkers, something that was rather nice in the ~35ºC heat. I think the Sailor branded beers were just rebadged Floris beers, but that’s merely based on a rogue beermat and the fact that they also had Delirium Tremens on tap. The pils was a solid belgian pils – light, refreshing and surprisingly malty. Sailor Apple – Grabbed by someone trying to be adventurous this was the first active beer Fail of the trip. It was overpoweringly flavoured with apple syrup and smelled like an apple strudel. Cloying and sickly. Sailor Dark – A sweet dark beer with a burnt caramel finish. Liefman’s Fruit – We’re still not entirely sure if this was actually a beer. Ordered by the brave soul who also went for the Sailor Apple, this was like drinking strawberry and cherry cordial and the barman poured it over ice. Not beery at all, but quite pleasant if you like fruit cordial. 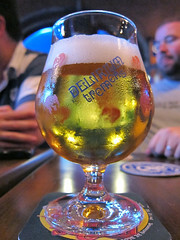 Delirium Tremens – One that I saved for my last drink at the Sailor Inn, not wanting to fall asleep too early due to its 9%. Rich and malty with an oily mouthfeel, and very good at hiding its 9%. One that I rather like but could lead to destruction way too easily. Corsendonk Pater Noster – A few doors away from the Sailor Inn we found another Belgian bar that we saved for another day. They were unfortunately out of the Corsendonk Agnus Dei so I went for the dark Pater Noster instead. It had a big fruity nose and was a rich flavoursome beer. A sour start led to burned malt with a lightish body and lots of fruit, almost reminding me of some British strong milds. Bellevue Kriek Low Alcohol – The potential curve ball beer, ordered to try and beat a lingering reminder of the previous night’s drinking. A good cherry nose led to a rather nice sour kriek. It didn’t have much on the finish and did go a bit musty in the middle, but was definitely beery. Maybe the best low alcohol beer I’ve tried.